Yodoxin is used for treating certain infections of the intestine. It may also be used for certain conditions as determined by your doctor. Yodoxin is an amebicide. It works by killing parasites (amoeba) in the intestine. Some MEDICINES MAY INTERACT with Yodoxin. However, no specific interactions with Yodoxin are known at this time. This may not be a complete list of all interactions that may occur. Ask your health care provider if Yodoxin may interact with other medicines that you take. Check with your health care provider before you start, stop, or change the dose of any medicine. Use Yodoxin as directed by your doctor. Check the label on the medicine for exact dosing instructions. Yodoxin should be taken after meals. You may crush the tablets and mix them in a tablespoon of soft food, such as applesauce or pudding. Swallow the mixture at once and follow with a full glass of water to ensure complete swallowing of the tablet. The mixture should not be stored for future use. To clear up your infection completely, continue taking Yodoxin for the full course of treatment even if you feel better in a few days. Do not miss any doses. If you miss a dose of Yodoxin, take it as soon as possible. If it is almost time for your next dose, skip the missed dose and go back to your regular dosing schedule. Do not take 2 doses at once. Ask your health care provider any questions you may have about how to use Yodoxin. Risk of decreased vision or eye pain or numbness, tingling, pain, or weakness in hands or feet may be increased with high doses or long-term use. Do not exceed the recommended dose or take Yodoxin for longer than 20 days without checking with your doctor. It is important to use Yodoxin for the full course of treatment. Failure to do so may decrease the effectiveness of Yodoxin and may increase the risk that the bacteria will no longer be sensitive to Yodoxin and will not be able to be treated by this or certain other anti-infectives in the future. Yodoxin may interfere with the results of certain thyroid function tests. These effects may persist for as long as 6 months after you stop taking Yodoxin. Make sure all laboratory personnel and your doctors know that you are taking Yodoxin or have taken it within the past 6 months. PREGNANCY and BREAST-FEEDING: If you become pregnant, discuss with your doctor the benefits and risks of using Yodoxin during pregnancy. It is unknown if Yodoxin is excreted in breast milk. If you are or will be breast-feeding while you are using Yodoxin, check with your doctor or pharmacist to discuss the risks to your baby. Constipation; diarrhea; nausea; rectal irritation or itching; stomach cramps. Severe allergic reactions (rash; hives; itching; difficulty breathing; tightness in the chest; swelling of the mouth, face, lips, or tongue); numbness or tingling of arms or legs; vision changes; vomiting. Store Yodoxin between 59 and 86 degrees F (15 and 30 degrees C). Store away from heat, moisture, and light. Do not store in the bathroom. Keep Yodoxin out of the reach of children and away from pets. If you have any questions about Yodoxin, please talk with your doctor, pharmacist, or other health care provider. Yodoxin is to be used only by the patient for whom it is prescribed. Do not share it with other people. This information should not be used to decide whether or not to take Yodoxin or any other medicine. Only your health care provider has the knowledge and training to decide which medicines are right for you. This information does not endorse any medicine as safe, effective, or approved for treating any patient or health condition. This is only a brief summary of general information about Yodoxin. 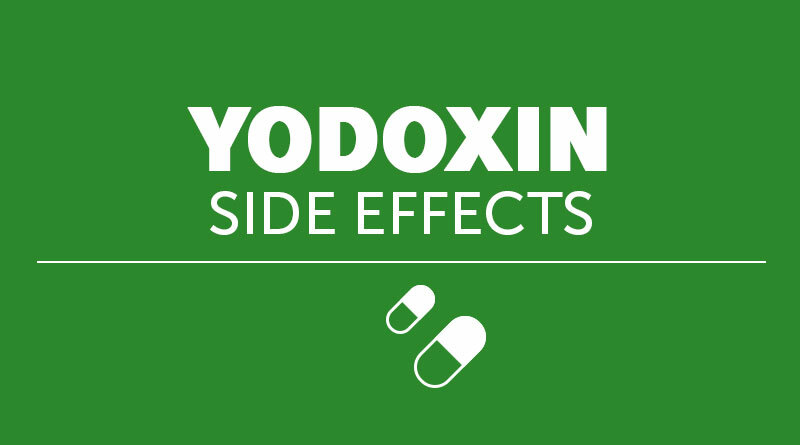 It does NOT include all information about the possible uses, directions, warnings, precautions, interactions, adverse effects, or risks that may apply to Yodoxin. This information is not specific medical advice and does not replace information you receive from your health care provider. You must talk with your healthcare provider for complete information about the risks and benefits of using Yodoxin.